Stories and Archives : J: By doing something good to change someone’s life, you can change your life in the process. J: By doing something good to change someone’s life, you can change your life in the process. “A tree is known by its fruit; a man by his deeds. A good deed is never lost; he who sows courtesy reaps friendship, and he who plants kindness gathers love.”- Saint Basil. For my service project I chose to do the box to Afghanistan because I believe although I may not be making a physical impact, the impact will be much more significant. My family doesn’t really celebrate any holidays because we can’t afford to or my mom is always working, we just spend money on what we need, that’s why I didn’t participate in the veteran’s village. I have a lot of respect for veterans, but I feel like mailing supplies to soldiers who are away from home, would serve a much greater purpose in accordance to my beliefs, values and what I can afford. Having worked with people who had served in the military also influenced why I chose to do this project instead of the others. I enjoy making a change wherever I can, I use to volunteer all the time when I was in high school. My major is environmental studies, this project can relate to my major because I’m contributing to my community by partaking in this assignment just as I would in my career without expecting much in return. Just like this project where I did not physically have to be present to change someone’s life, as an environmentalist I will be improving people’s lives indirectly by contributing to nature and Earth’s wellbeing. This project can affect a community because it can bring awareness about our uniformed heroes and how we should be more grateful to them. It shows people how important it is to be active in your community in any way possible. Most people do not have the slightest idea of the sacrifice and conditions our troops undergo day to day, and how a simple action can change someone’s life. Coming from an area where most people are below middle class, I can imagine among those people are single mothers that have their children enrolled in the forces and can’t provide much aid to them, or those who don’t have families- the least we could do is send them food or toiletries as a form of our gratitude and show them that someone appreciates them. I chose to put more food than supplies in my box because in psychology I learned about Maslow’s hierarchy of needs. Maslow’s hierarchy of needs shows, to move up the pyramid, you must first meet the basic needs, such as food and water. I figured because of this, that they would appreciate more food than toiletries or office supplies. 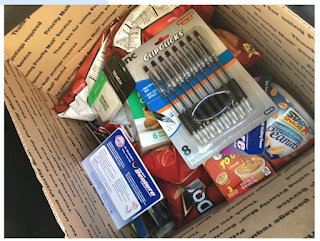 I used some of the snacks my mom sent me from Miami and went to Walmart to purchase more things like Doritos, beef jerky, Cheez-its, Nutella, trail mixes, college ruled paper, pens, tooth brushes, tooth paste and several other things. I do not work, and my mom can’t maintain me that’s why I couldn’t stuff my box with as much things as I would’ve liked too. Along with everything I gathered to put in the box, I added a personalized card. My intention was to make whoever received my box smile and allow them to forget all their hardships for at least a second. I’ve done a lot of research on a couple of the military branches because I wanted to join for a long time; this has allowed me to understand them a little more than I did in the past, although I will never truly understand unless I were in their shoes. No benefit in the world is worth enough to put your life and mental health at risk every day and our troops do it anyway and proudly serve our country. If I was serving in the military I know I would like to be shown some sort of appreciation, I’m sure anyone would. Treat others as you would like to be treated. Family can only do so much, but if there are people from all different walks of life showing love, I would feel even more proud to serve my country. At first, I didn’t think too much of this project, but while I went shopping for the stuff, my perspective on the entire assignment changed. Sometimes you get lost in your own problems and routines, that we forget that there are people out there that are worse than you. By doing something good to change someone’s life, you can change your life in the process. I felt more human than I had felt in a long time. This project inspired me to continue helping others, whether I can see the impact or not, I know I did something rather than doing nothing. I may not have much to offer, but being able to offer the little I have made me realize that if I did it, then those who are financially stable should be contributing to our troops at least once a year. People spend hundreds of dollars on Starbucks coffee or McDonalds a year, yet can’t send at least $20 dollars a year worth of supplies to our troops. Without our troops this country and its people would not be as safe as it is today. Completing this assignment motivated me to keep doing this at least once a year and if I have a family of my own in the future, I am going to make this a family tradition.